It's easy to get excited about home theater that's easy on the wallet. And in recent times, we've been spoilt for choice. 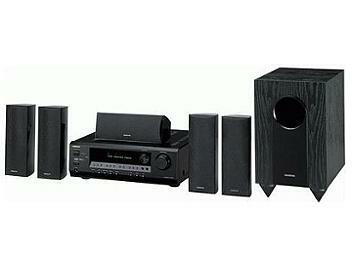 The only downside is that most packaged home theater systems have largely missed the target. It's all about covering the fundamental A/V considerations-that's the design focus of the HT-S3100 5.1-channel receiver/speaker package. Where others fall short, the HT-S3100 covers today's key entertainment options-DVD video, audio CDs and digital music files, TV and satellite broadcasts, and gaming. With the reliability of component video, you can even bring Blu-ray Disc into the mix. And as with all Onkyo A/V components, the HT-S3100 has a trademark amplification design that puts power and precision before all else.